The Green Car Guide to the lowest emission and most eco-friendly sports cars on sale in the UK today. We list our top diesel, petrol, hybrid and electric sports cars which have all been road tested by the Green Car Guide team, with the aim of finding cars that are great to drive but efficient. The BMW 2 Series Coupe combines strong performance, good economy and low CO2 emissions in a compact, agile rear-wheel drive sports coupe. The BMW 4 Series Coupe features all the benefits of the 3 Series Saloon – including performance, efficiency and rear-wheel drive handling – but in a more sporty Coupe body style. There’s now a Caterham 7 with a 660cc turbo engine and it returns 57.6mpg. 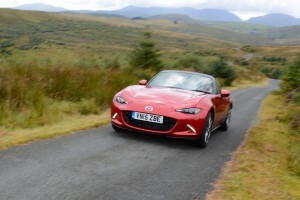 The MX-5 remains a beautifully balanced car. This is good news as it enables the Mazda to maintain class-leading fuel economy and its fine handling. Lotus has got away with very few updates for the Elise. The latest introduces a new Toyota derived 1.6-litre engine which dramatically reduces fuel consumption. 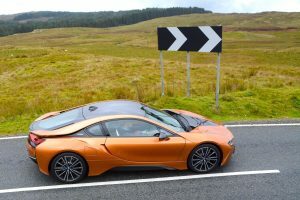 The BMW i8 looks amazing, it’s fantastic to drive, and thanks to its plug-in hybrid electric/petrol powertrain, it has an official economy figure of 158.9 mpg.